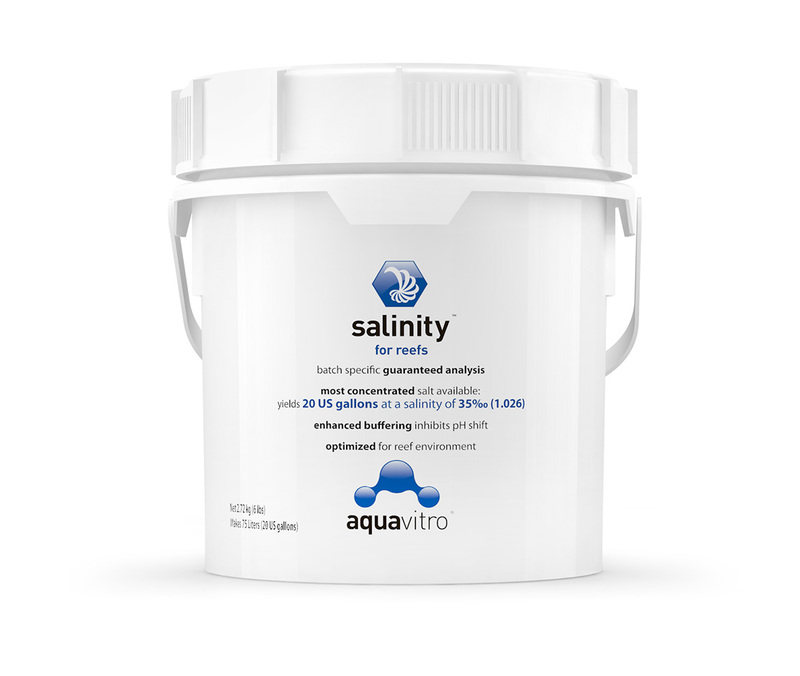 salinity™ is a blend of salts specifically formulated for the reef aquarium that contains all essential major, minor, and trace components found in natural reef waters, but contains no toxic or non-essential components. 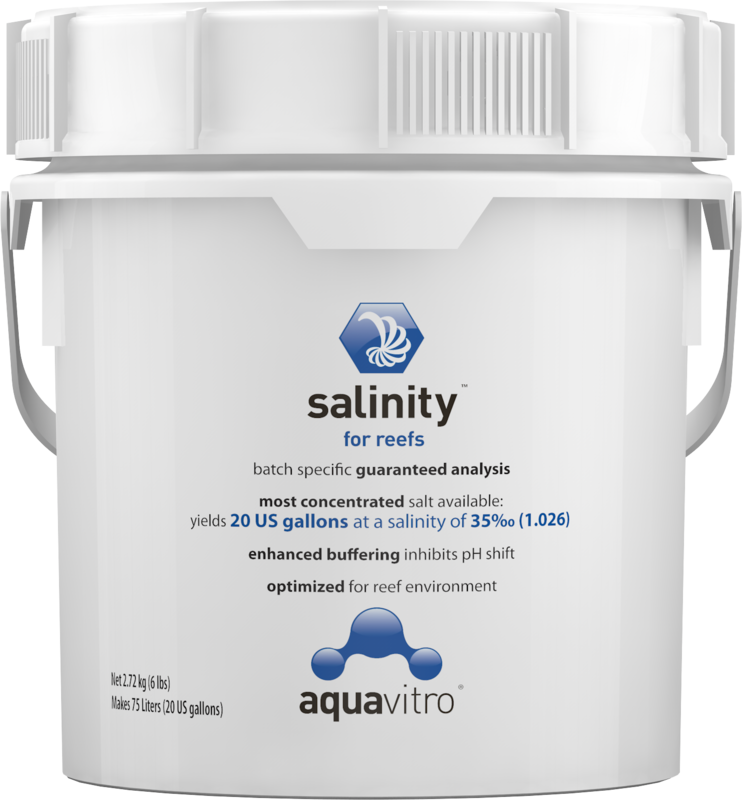 Additionally, salinity™ is the most concentrated salt blend on the market. 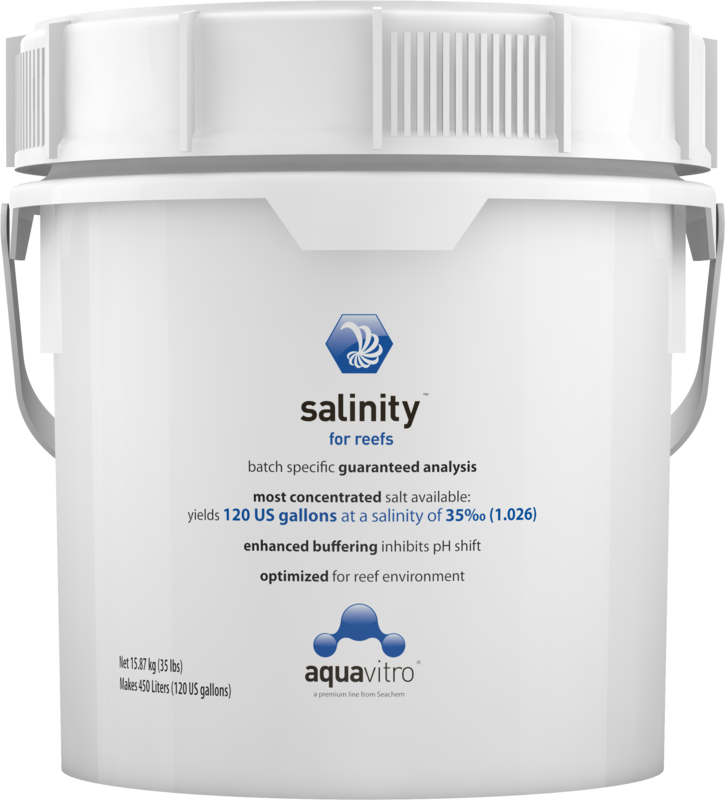 With a hydration level of <0.5% salinity™ will yield a greater volume of prepared saltwater at a salinity of 35‰ per unit of weight than any other salt mix currently on the market. 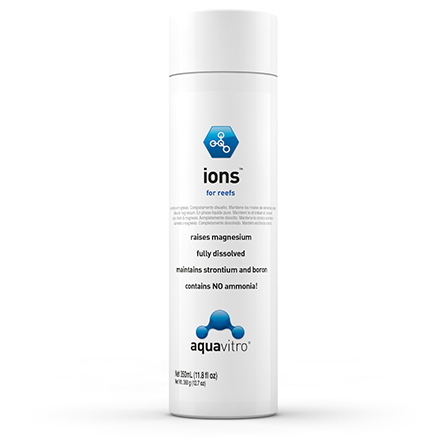 salinity™ is identical to the distribution of anions and cations found in Natural Sea Water (NSW). We have compiled data from all the oceans and seas on the Earth, and have targeted the midpoint of the range for each element. We guarantee to be within ± 5% of the midpoint. At a salinity of 35‰, for calcium, magnesium, strontium, pH, and alkalinity we have the following targets and/or ranges (see right). Stir well to ensure a good mix. 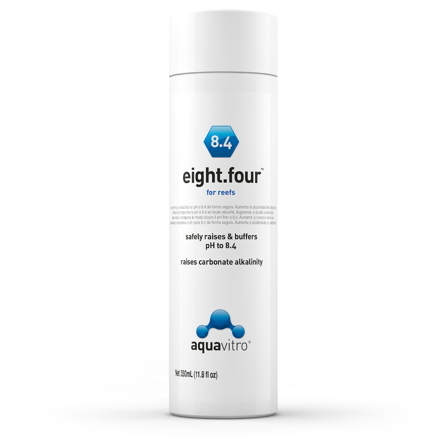 Although the salinity™ solution may be used immediately, we suggest mixing for approximately 24 hours to achieve oxygen/carbon dioxide equilibrium. Adjust salt level accordingly. If salinity is too low, then add more salinity™. If too high, add more water. USAGE NOTE: NEVER mix salt in an aquarium containing livestock. Transfer livestock to the aquarium AFTER salt is completely mixed and specific gravity has been adjusted. Use Seachem's Stability® to avoid "new tank syndrome" and to prevent unnecessary livestock losses in a new system. 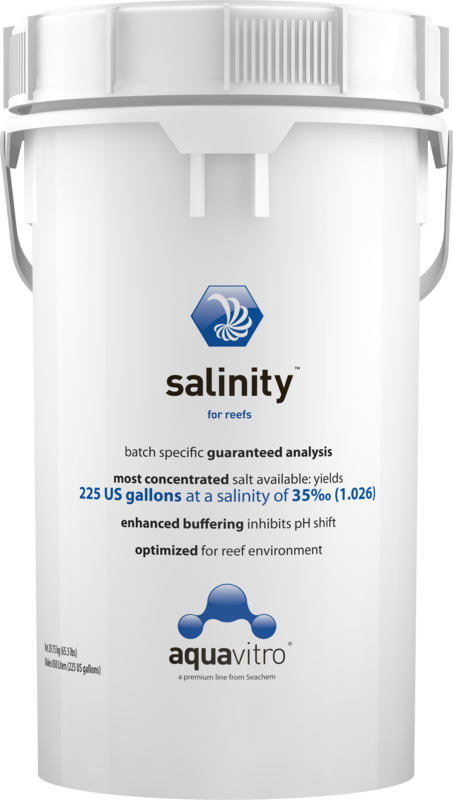 Every bucket of salinity™ comes with a laboratory tested*, batch specific guaranteed analysis. We guarantee that salinity™ will have a guaranteed analysis that falls within the ranges below. When I mix salinity salt in my water barrel using a pump and a heater I get cloudy water. What is happening? When mixing this salt, we have found that 24 hours or less is ideal (more specifically 6-10 hours is best). The longer you let the salt mix, the more CO2 it will take on and the more precipitation you will encounter. CO2 --> water --> carbonic acid --> bicarbonates/carbonates. Mixing the salt for more than 24 hours can cause a decrease in alkalinity and pH, resulting in a precipitation of calcium and carbonates. When we mix it here at Seachem, we mix it in 50 gallon drums with one power head at room temperature (22-25 degrees Centigrade). There is no need to use a heater or multiple power heads. As a matter of fact, we do not recommend using a heater or powerful circulation when mixing Salinity. Typically the water is clear within a few hours but sometimes we have to use it within an hour of mixing, when it is still cloudy. This cloudiness clears rapidly once introduced to the tank, generally within 30 minutes, and will not cause any harm to the inhabitants. Furthermore, cloudiness seems to persist more with buckets that have calcium and alkalinity levels on the higher end of the range. This is really inevitable when you have such high levels of those particular components. I would recommend that you check the strength of the pump and reduce it if necessary, and to hold off on using the heater until the mixing process is complete as the heated water will create higher likelihood of precipitation. I am mixing my saltwater to 1.025 specific gravity. 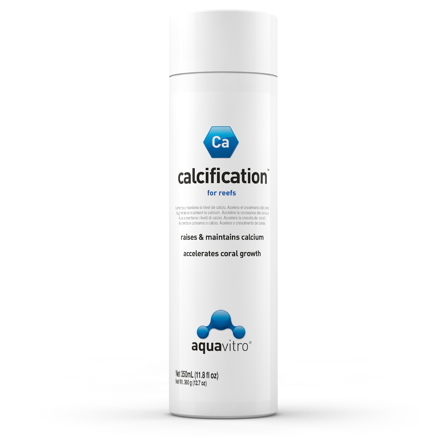 Your label guarantees 410 mg/L for calcium but when I test, I only get 385 mg/L. Am I doing something wrong? A: When our batch samples are sent off to the lab to be analyzed, the guaranteed values are at a salinity of 35 ppt. We do not use the measurement of specific gravity because this measurement is temperature dependent. While your specific gravity is 1.025, this does not mean that your salinity is up to 35 ppt. It is best to use a temperature compensated refractometer and measure in terms of ppt in order to achieve accurate parameters. CAUTION: SALINITY™ IS NOT FOR HUMAN CONSUMPTION. KEEP OUT OF REACH OF CHILDREN. Contact in dry form may cause skin or eye irritation. In case of eye contact, completely flush eye(s) with cool water and seek medical attention.